Oi! EU! Tax On Vaping? NO! You may remember that last month was the closing date for an EU consultation on the taxation of manufactured tobacco products. The EU being the meddling EU, this naturally included their initial fumbling towards abusing e-cigs by taxing those too ... despite the devices and the liquid not containing any "manufactured tobacco" whatsoever. The first results of the consultation have now been made available here, and there are some interesting discussion points. Firstly, out of 7,686 responses, over 95% of them were submitted by members of the public, with only 3% coming from industry and a mere 1% from NGOs such as those in tobacco control. When tobacco controllers like to paint themselves as a David to the industry's Goliath, that pales into insignificance when it comes to their importance when the public itself gets motivated (more on that later). 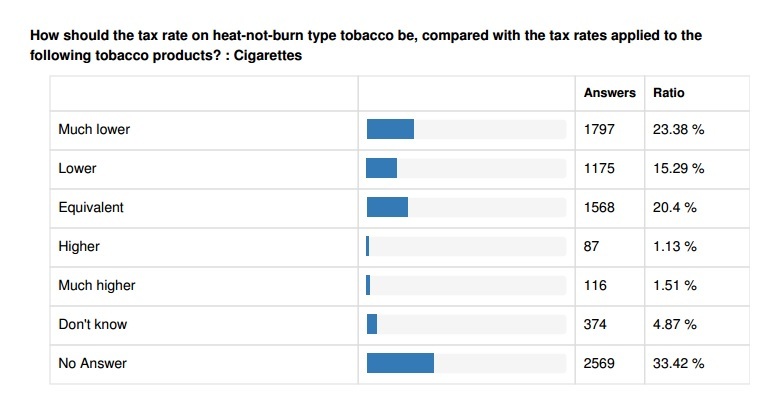 Because on the subject of e-cigs especially, the answer to the EU's suggestion of adding tax to vaping was pretty emphatic. And the answer was NO! Yep, a whopping 90% of replies said that the EU should keep their snouts out of vaping and just forget the idea (not that they will, from my educated guess). Now, it's true that a large majority of the respondents were vapers - to be expected as there was a lot of social media encouragement to take part - but it's significant that those declaring themselves to be e-cig users only accounted for 68% of the responses. 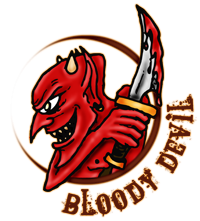 So there was also substantial agreement from smokers (4%), non-smokers and even perhaps governmental and non-governmental bodies to reach such a high level of consensus. The UK featured prominently in the published statistics, making up 8.44% of the total (649 fine upstanding individuals), but were pushed into 3rd place behind Germany (40.48%) and Poland (23.8%). 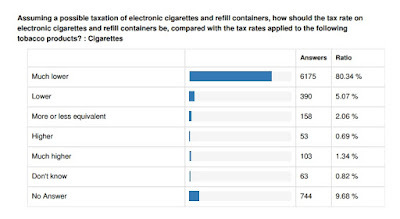 As you can imagine, with so many logging on just to register their objection to taxation for e-cigs, the post-consultation report's 67 pages are full of tables showing around about 70% of respondents understandably not giving an answer on subjects such as waterpipes, cigarillos and raw tobacco, so the EU will be playing with meagre percentages on a lot of their subject matter. However, one thing that was quite disappointingly clear is that the theory of harm reduction doesn't extend to new 'heat not burn' technology amongst vapers. 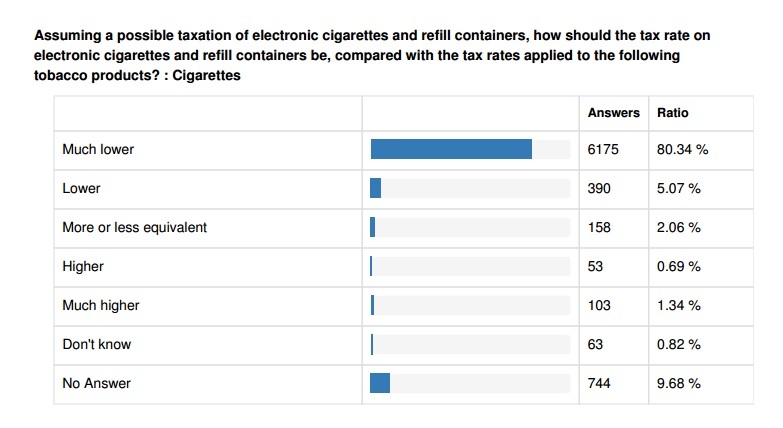 To illustrate, asked what a prospective tax rate on vaping should look like, presumably all vapers and another 12% on top thought it should be much lower than cigarettes. But when the same question was asked about heat not burn, the picture looked very different. This isn't altogether a surprise. Only 81 people identified as users of HnB - which is to be expected due to the market not being established in Europe yet - so there isn't a great deal of understanding about the concept, and also much distrust about products like iQos, most notable of which being that their emergence might be conflated with e-cigs and sway public perception so far as to favour prohibition and bans on vaping too. This has some merit, but if being consistent the same could also be said about sub-ohming huge clouds in public. I get the nuances, but vapers have two arguments; freedom choice and health, and the health one relies heavily on the very powerful tobacco harm reduction aspect, especially when talking about recreational use. 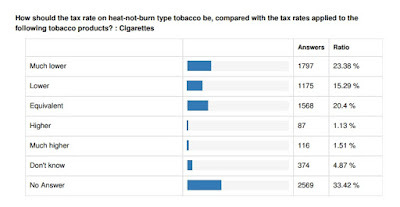 While it's clear that many respondents were only interested in lending their support to vaping because that's the device they use, it's disappointing that so many are so distant from the harm reduction debate that they are not confident in saying that HnB excise should be set as lower or much lower than tobacco, which is quite obviously the case. Maybe my personal view is not widespread, but if using the harm reduction argument to facilitate being left alone with recreational use of nicotine, picking winners within the harm reduced category is not the way to go. You have to idly wonder what would have been the result if snus was included in this consultation, I have to say. We will never know, of course, because snus is officially banned by the EU despite the TPD consultation in 2011 showing 84% of the public saying the ban should be lifted. Just as now in 2017, back then a large proportion of the responses came from Poland, which led to the EU throwing out 82,000 of them on the corrupt premise that they were from the tobacco industry. It was clear back then that tobacco control was a tiny David in comparison to the Goliath of public opinion, but that didn't matter to the EU, who listened to a few small dictatorial voices and perpetuated the stupid and science-free ban on snus anyway. Remember that next time some tobacco controller bleats that they are overwhelmed by industry power, because it is proof they are lying to you. I expect the EU and their hideous NGO chums will probably try the same kind of anti-democratic shenanigans again, but will be more sorely tested with 90% of respondents saying e-cigs should be left alone, from a hefty cohort of 7,686, 95% of which are ordinary citizens. Some people say that the EU isn't very democratic. This might be an interesting experiment to prove or disprove it, doncha think? Bans Destroy Businesses, Why Lie About It? When Is 24% Not 24%?